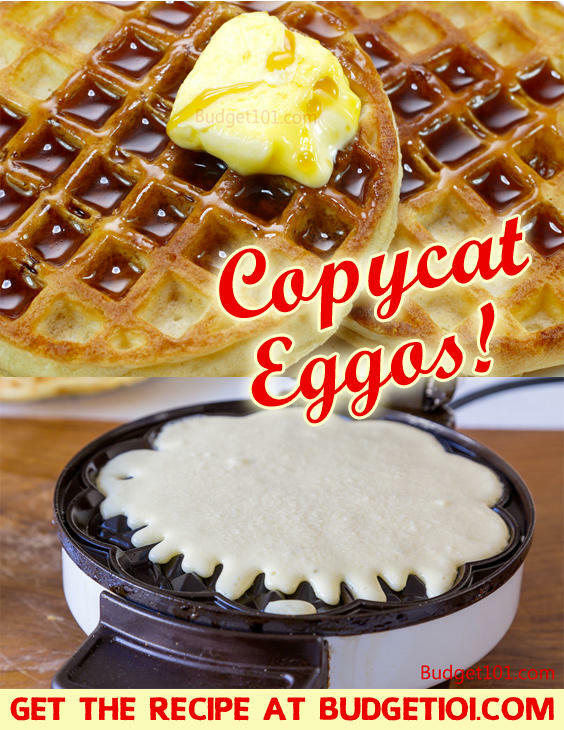 If you love the taste of those convenient frozen Eggo waffles, you’ll really adore this copycat recipe that tastes identical to the store bought version. We recreate name brand foods for a number of different reasons, sometimes we don’t like the use of certain ingredients in a product, or it’s too expensive to purchase in the quantities we’d need to feed our family, (when you’re feeding 2 teen boys and several of their friends, they can go through 3-5 Boxes of these in one day! Sometimes the product isn’t available in our area (or easy to get to)- for example when we lived in the midwest it often took over 2 hours to get to our nearest Supermarket, during the summer months when the temperatures hit triple digits, we couldn’t possibly get frozen food home before it thawed, so purchasing these tasty morsels wasn’t an option for us. Sometimes, we just plain like the challenge of trying to recreate our favorite foods. In cooking recipes often call for buttermilk, which is relatively expensive to purchase in liquid form and keep on hand because it doesn’t have a lasting shelf life. Since we tend to cook with it several times per month we purchase Buttermilk Powder instead. In a mixer, beat eggs and sugar with a mixer on high speed for 1 minute. Add water, milk, oil and buttermilk, mixing well until combined. In a medium bowl combine flour, baking powder and salt mixing well. Add the dry ingredients to the mixer bowl, mixing on medium/high for 1 minute. (If making the blueberry waffles, add the blueberries now). Heat the Waffle Iron, Spritz it liberally with non-stick spray (we use an olive oil Misto!) Pour 1/2 cup of batter into the center of the waffle iron, allowing it to spread evenly and cook about 1 minute. Do not cook longer, the point is not to brown the waffle, this will be done in the toaster later!! Cool, place in freezer or vacuum seal bags and freeze. To enjoy, pop a waffle or two into the toaster on the lowest setting and toast, top with butter, syrup, fresh berries, etc as desired. The recipe makes about 9 large Round waffles, but we recommend using a square waffle maker because they seem to toast more evenly and fit in the toaster better! Visit Budget101.com for complete instructions.